Teaching and learning online is the latest trend in education! This 20-hour distance education course is designed for educators interested in keeping up with new teaching technologies by teaching and designing online courses. 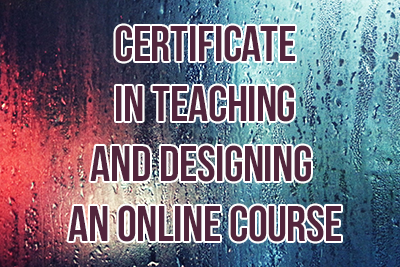 The course decribes features of an effective online course design and includes units on hurdles in online teaching/learning, learning styles, CMS (Central Management Systems), forms of assessment, uploading files, graphic organization and basic terminology. Upon completion of this course you will know how to design and teach an online course in your field of education.